« MorpHex MK-II in Action! PhantomX Hexapod & Quadruped Updates! 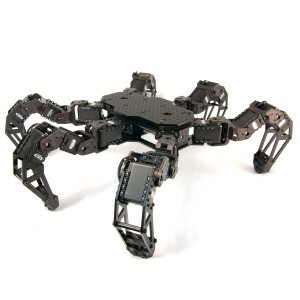 We’ve just updated our PhantomX Hexapod MK-II and PhantomX Quadruped MK-II. These updates are designed to improve the durability and expandiblity of the crawlers. The body plates also have 2×3 cm hole patterns, making it easy to mount a variety of RobotGeek Sensors directly to the Hexapod. The PhantomX Hexapod now comes with a Top Deck Mounting Plate. This plate can be secured to the main Hexapod Chassis, making it easier to add more batteries, sensors, controllers and more. The top deck come covered in a 1×1 cm pattern, making it easy to attach a variety of RobotGeek Sensors, Turrets and more to your robot. Future Trossen Robotics products will include 1×1 cm grid compatible MX turrets and adaptor plates for other computers and controllers. The top deck can be configured to rest at multiple heights, allowing you to customize the look and function of your robot for your exact needs. The crawlers now route all power through the new 6 Port AX/MX power Hub. This provides improved power balance and eaiser wiring. This also makes it easier to confiugure the Quadruped in Developer Mode, giving you easier access to the ArbotiX while developing. If you have previolsuly purchased a PhantomX Hexapod or Quadruped MK-II and would like updated plates, please Contact Us via this page and include your name and order number. This entry was posted on Thursday, May 8th, 2014 at 4:25 pm	and is filed under Featured Projects / Robots, Misc. You can follow any responses to this entry through the RSS 2.0 feed. You can leave a response, or trackback from your own site.